Sea holly (Eryngium spp.) is a large group of annual and perennial flowers found in coastal and dry land habitats throughout the world. Valued for their striking architectural form and the colored foliage found on many of the varieties, sea hollies are a little known treasure in the world of ornamental plants. 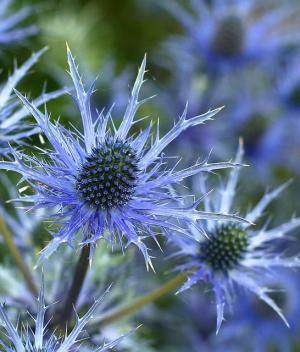 A number of species of Eryngium, which goes by the names of both sea holly and eryngo, have been cultivated as garden plants and many named varieties are available in nurseries. The plants have finely divided leaves, often with prickers at the tips, and bear a strong resemblance to thistles to which they are closely related. However, their ornamental qualities are much more refined than any thistle and they are not invasive like many thistles are. The most commonly grown varieties have colored foliage in varying shades of silver, green, blue, purple and white. 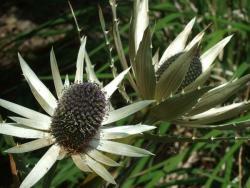 Flowers are cone-shaped and surrounded by a wispy crown of bracts. Sea hollies have an upright growth habit from two to six feet, depending on the variety, and flower repeatedly from midsummer into fall. 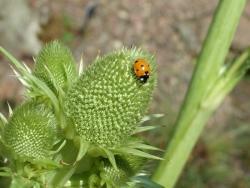 Sea hollies are attractive to butterflies and other beneficial insects, like ladybugs. They are stunning in the garden, but are more often seen in florists shops - a shame since they are so easy to grow! Sea holly is a great candidate for the middle or back of a perennial border as long as its not grouped with perennials that have high water and fertilizer requirements. It fits well with plants from arid regions, making it suitable for desert, Southwestern or Mediterranean themed landscapes. Surround it with succulents and other species that are known for their foliage as much as their flowers. The many species and cultivars of sea hollies all share similar growing requirements. They like full sun and well-drained soil. They thrive in poor, sandy soil and are extremely drought-tolerant. They are one of those special plants that performs better without fertilizer, compost or irrigation. Transplants are available in many nurseries, but if they can't be found, try one of the following seed companies for a good selection of sea holly varieties. 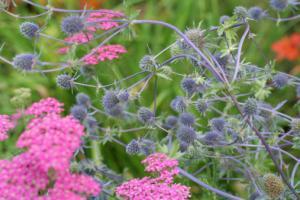 Sea holly is easy to grow from seed and should be sown directly on the surface where it is to grow. Swallowtail Garden Seeds sells several varieties with 15 to 40 seeds per pack for less than $5 each. Amazon.com carries Blue Star sea holly seeds at approximately $2 for 25 seeds. Sea holly is untouched by pests and disease. It needs a bit of water to get established, but little ongoing care is required. The dried stems provide winter interest in the garden, but should be cut to the ground before new growth begins each spring. In rich soils the plants may flop over and require staking. Both the immature leaves and the roots of sea holly are edible. The shoots are sometimes blanched - that is, grown without light so they will be very pale in color - and served as an asparagus substitute. The roots, boiled or roasted, taste like chestnuts. The colorful foliage and flowers are fantastic in floral arrangements, both fresh and dried. 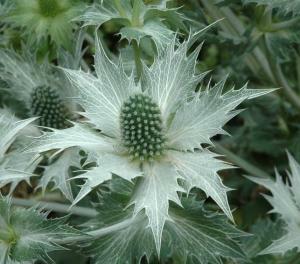 Sea holly varieties vary in color and size. The following cultivars are among the most exquisite and commonly available. Sea hollies have never been counted among the most common perennial flowers, but they certainly deserve to be. Though they are bit prickly to the touch, few other plants have such a refined and unique aesthetic.